I have been having lots and lots of fun at TechShop since they opened in March in Pittsburgh. I've made Instructables for some of my projects as I go along, and I'm sure I'll be making more, but I also want to document things here, where I can talk a little more about the process, and where I can document some things with just a quick photo instead of a full step-by-step. This fishbowl pendant was one of the first things I made on the laser cutter without modifying someone else's pattern. I found a small scrap of 1/8"-thick clear acrylic in the discard pile, and thought, "What can I make with this?" In the first iteration, I drew the bowl in in Illustrator, and had a fish design etched into the surface. It was fussy and hard to see. "What if I cut out the fish? How simple can I make this?" So I drew a cartoon fish with an oval and triangle joined together. Sandwiched the fish cutout bowl between two solid bowl layers. Nice, but still a little too subtle. "If the fish had more contrast..." I had origami paper in my bag. It only took a moment to cut the same fish shape from the paper. I doubled the shape and folded it along the tail, so that the orange color coud be seen from both sides. As long as I held the three layers of acrylic together, the fish didn't fall out, but I wanted to keep my goldfish in its bowl, so I went in search of adhesive. Acrylic adhesive is funny stuff - it melts the surfaces, I think, and then they fuse together. Air bubbles got between the layers as I was adhering them to each other, and at first I was disappointed, because I'd envisioned three clear layers. When it became obvious that I would have watery-bubbly marks, I decided that the marks represented the water in the fishbowl. Because the acrylic is thicker than the origami paper, the fish can move a tiny bit if you shake the pendant. I took pictures as I went along, and made this Instructable to share. Imagine a reading room full of these. A design project by students at ECAL in Switzerland, via Apartment Therapy. Modkit Micro is now free to use online. I'm in one place and my Arduino and Lilypads are in another, but as soon as we are together again, I look forward to seeing what it's like to use a Scratch-like interface to program an Arduino. 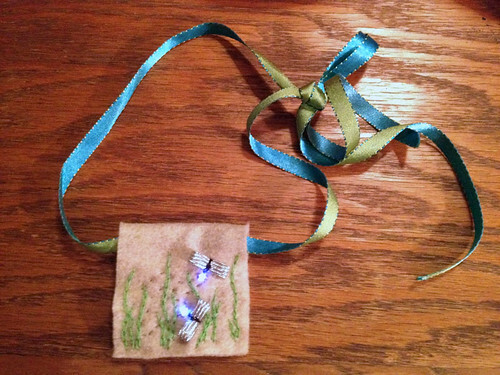 Firefly LED necklace. Made to share with students in a soft circuits workshop next week. Embroidered on felt, with ribbon loops for the wings. I'm taking part in a Learning Party at Assemble - a community space for technology and art in my neighborhood. Tonight's theme is "Circuits & Contraptions" so what better time to make conductive playdough? I cooked up the recipes two nights ago, and I'll be bringing both conductive and resistive playdough, some 10mm LEDs, a couple of 9-volt batteries, a tiny piezo buzzer, a small DC motor, and a handful of pipe cleaners for extra squiggly conductive shapes. I've been interested in the possibilities of conductive playdough for a while, ever since watching AnnMarie Thomas's TED talk. and the original conductive playdough site created by AnnMarie Thomas's research group. I'm not spending much time online - as little as possible for the next week and a half - so rather than post sporadically and worry about it, I'm just going to declare a slight pause and resume with the new year. Hope everyone who celebrates has wonderful holidays. See you again in 2012. See yesterday's entry. A quiet rhythm to the day. Groceries. Knitting. Reading. Talking. Minimal time online. Yes, we have internet access. Winter break began at noon - hooray! And now comes the difficult part - beyond rest, reflection, and family time, what projects will I focus on during these two weeks? That question partly answered by the arrival in yesterday's mail of a small jar of conductive paint. I think I may play with paper and circuits. What happens when pop-up constructions use conductive paint? Can I make something that is interesting beyond the gee-whiz factor? What are the fewest materials I can use and still have fun? Can I make switches? Probably. Can I make a variable resistor with this stuff? Dunno. I'll play and see where it takes me. Half a school day left before winter break. Mostly offline this evening, reading a book, and then helping the youngest make the family recipe for Old English Toffee - household treat and teacher presents. Lackadaisy writes about the construction drawing process, and about ways to create characters you can draw consistently. Our winter holiday break approaches, and my mind turns to all the projects I'd like to start or complete, books I'd like to read, time I'd like to spend looking at the horizon - both literally and figuratively. The challenge - as always - is to find one or two things to concentrate on, not fourteen, so that I return rested and renewed. Brought to us by the amazing Vi Hart. Making Paper Houses from Bare Conductive on Vimeo. More information here, at Bare Conductive, where you can buy conductive paint for electronic crafting. Yesterday's collage feels like an illustration for a story - I just haven't figured out the story yet. Played with images taken with my iPhone, and combined and modified them using apps on the phone as well. I made bread to go with dinner, and youngest made cookies for the school bake sale. My Tiny Penguins project was chosen by the editors as featured step-by-step tutorial on the Instructable website. It's entered in a contest for Teachers, too - so if you like, you can go vote for it... thanks! The tiny penguins are very easy to make, requiring a minimum amount of sewing, and the materials are inexpensive - less than 75¢ per bird, and that includes the two nickels that are added to the stuffing so that the penguins stand upright. Singing. And then later, dancing at a friend's birthday party. The Economist publishes an article about DIY and the makers' movement: "More than just digital quilting." So happy to see that a story about the Exploratorium's Tinkering Studio was on the front page of the San Francisco Chronicle. The full text of the story is online, here. No knitting time today - though I did take the scarf-in-progress with me. Elizabeth Perry commented on stuff finished: I just added one of them to the post! Thanks for asking. Elizabeth Perry commented on new math: Thanks. The day was bright and beautiful and the cake had raspberries to go with it... mmm. lilalia commented on new math: Happy Birthday! Enjoy the sunshine and cake. Elizabeth Perry commented on new math: Thank you so much! Pratyusha commented on new math: Happy Birthday Elizabeth! May this year be a happy, healthy and creative one for you! Karen from Chookooloonks commented on new math: Happy, happy birthday, friend.